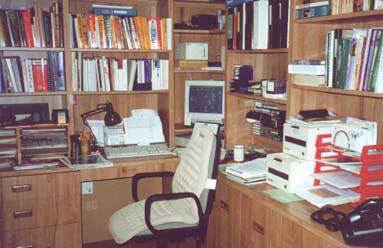 Even with 5 grandchildren (Matthew, Sierra, Paul, Heather and Angela) plus a miniature apple orchard, Joe still had time to operate his business in his home office. 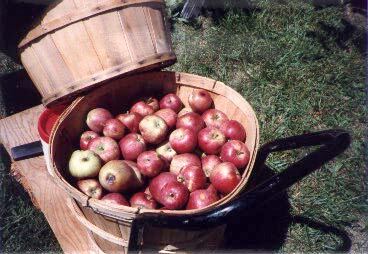 (Except when he is out picking apples). With 30 years experience writing technical manuals for many different companies, Joe has seen the technical manual production techniques progress from the #2 lead pencil and Selectric typewriters, with commercial line-o-types and Varitypers, Compugraphic phototypesetters with STAT cameras, rubber cemented or hot-wax paste-up masters and golden rod negatives, to electronic DeskTop publishing and camera ready copy being done with laser printed 600 DPI masters (breath). Today the industry is changing further into a third phase of online documentation, CD-rom manuals with interactive help screens and Internet WWW Home Pages with color graphics and digital cameras, sound generators and order forms via Email and Fax. As this area evolves, Joe has maintained his balance by offering www page construction and web connection through a service provider. The service is called Plexusmedia and is composed of Joe, his partner Mike, and several part-time contractors. You may wish to check it out while you are here. Since 1965, Joe has been a member of the Society of Technical Communicators (STC) and has won several recognition awards from the STC and the CEA (Cincinnati Editors Association) for industrial manuals. A vocational (Trade) school graduate, Joe studied Automotive, Machine, Wood Working, and Sheet Metal shop programs for three years (6 months each) and then majored in industrial electricity his final two years. Co-op jobs are required in the trade school curriculum. He knows the language of the shop. After high school, Joe served in the US Navy during the Korean War first aboard a Destroyer (US Black DD 666) where he rode out hurricane Hazel off Cape Hatteras (He's been trying to get back to the outer banks ever since). Joe then transferred aboard a repair tender (US Tidewater AD-31). As a shipboard electrician with the engine room generators, pumps and motors as his areas of responsibilities, Joe learned the trade well. After an honorable discharge in 1956, Joe went to work first as a shop maintenance electrician and then, in 1959, moved to Allis-Chalmers Motor division (now Siemens Energy & Automation), testing motors and generators in the factory. Always wanting to be an electrical engineer, he enrolled in evening college under the GI. Bill and applied for a transfer to Allis Chalmers electrical engineering. After being laid-off several times in the shop and working at U.S. Playing Cards, Joe finally moved to Allis Chalmers engineering as an electrical technician evaluating and writing test data procedures. Continuing with night college, Joe found that the trade school math was not enough to support calculus and the higher math requirements for engineering courses. After several attempts ended in a D grade, he decided to pursue the Natural Science and Humanity courses but still took as many basic engineering core courses as possible. Meanwhile at Allis-Chalmers, Joe was assigned the documentation preparation responsibilities for both motor and pump divisions. This created a need to study more writing and linguistic courses. There was no Technical Writing curriculum in the Sixties so Joe developed his own. Majoring in the Sciences with a minor in Journalism and after several starts and stops, Joe finished with 10 years of night college in 1973 and an "Associates in Arts ". He and the family celebrated with a wonderful trip to Denver and the Mountains. More photo's and home construction details.